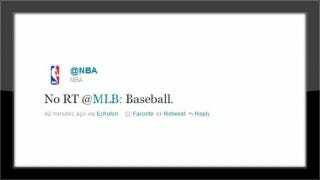 Last night, minutes after the Green Bay Packers had won the XLVth Super Bowl, the MLB employed tweeter released a simple tweet into the universe: "Baseball." The NBA employed tweeter did not agree with this sentiment. It would be lovely if this continued to escalate ("double plays are simply not very exciting! "), but alas, the NBA deleted the offending tweet just minutes later. Luckily, Jon Bois of SB Nation managed a screen grab. All this after Harry Caray's statue at Wrigley Field suffered some minor vandalism this past weekend. Caray, though, probably would not have known what the big deal about Twitter feuds is, anyway. The NHL Twitter feed had no comment.